A Likert scale question is a list of statements with response points that indicate agreement. 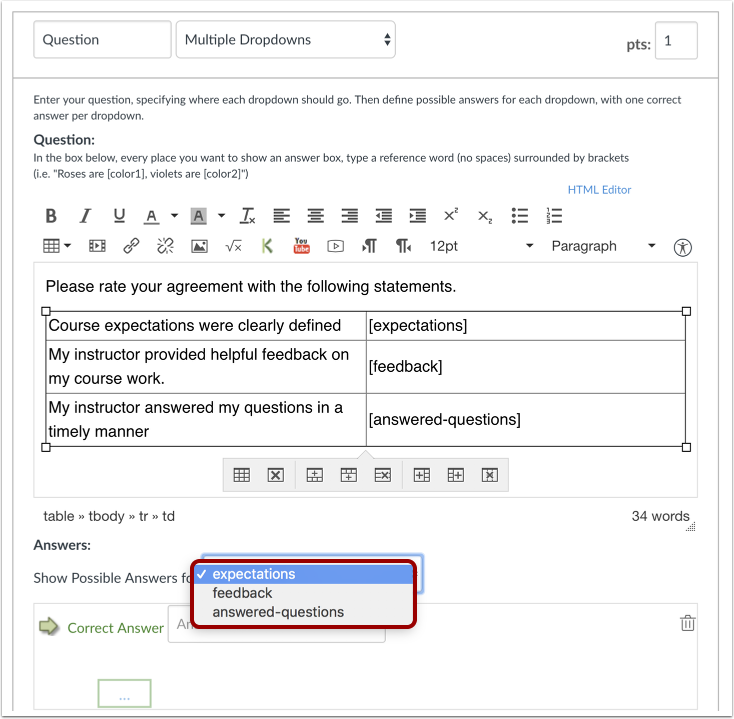 Canvas' Multiple Dropdown question type can be used for Likert-style questions in Surveys. After clicking the Quizzes link, either create or edit a quiz. Make sure the quiz type is set as either a Graded or Ungraded Survey. After adding in any preliminary instructions, click the table icon  in the Rich Content Editor and choose two columns  and as many rows as you need (one per statement) to contain the entire Likert scale of items. In this example, there are three rows. 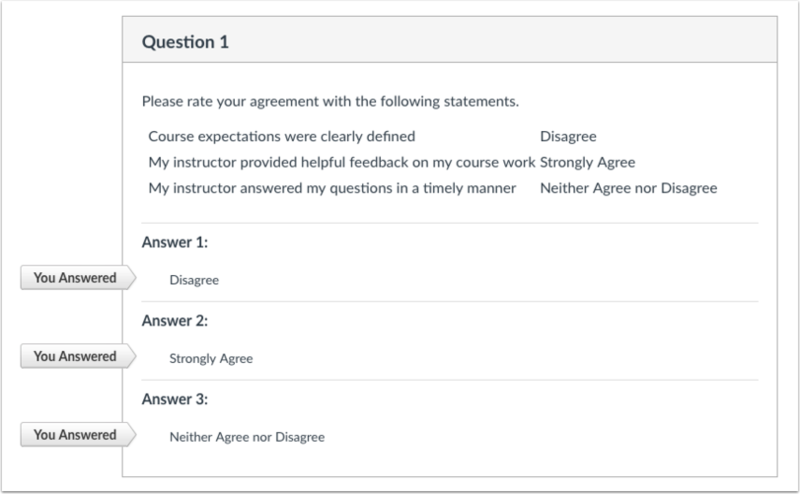 Each row of the table will be a distinct Likert item, which is a statement with answer choice boxes, and users can select how strongly they agree or disagree with that statement. Create a name for the answer choice boxes, and use square brackets to frame the answer choice boxes. In this example, we made expectations, feedback, and answered questions the reference words to create answer choices for the three statements and set them up as [expectations], [feedback], and [answered-questions]. Note: Likert items cannot contain spaces. You can separate multiple word Likert items with hyphens. Each Likert item needs to have its own listing of responses as possible answers. Select each Possible Response and add as many Answers as possible, with consistent Answer Text. You will have to input the Answer Text for each answer choice box. For example, [expectations], [feedback], and [answered-questions] will all need to have each possible response added separately. 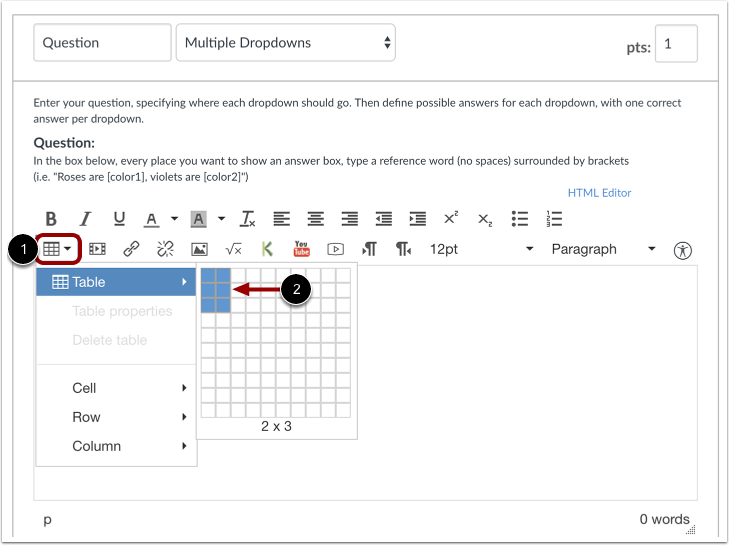 Learn more about multiple dropdown questions. When you are finished, select the second reference item and repeat the process of filling in the Likert responses. Repeat this process until all reference items are associated with Likert response options. 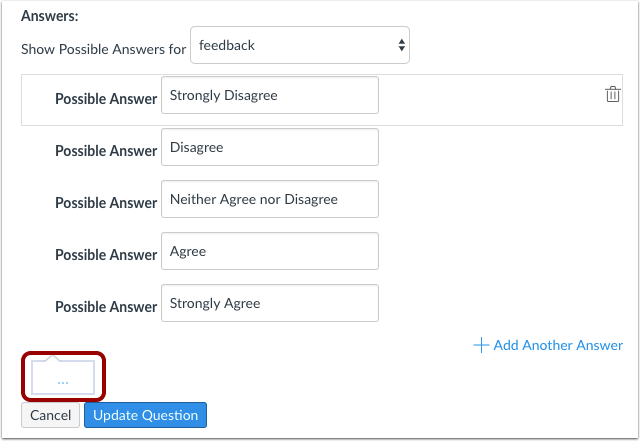 You can also create general answer comments for the survey question as a whole. All students will see the feedback in the blue comment field as soon as they submit the quiz. This is what the question will look like in a quiz. Each statement will show the drop-down menu with the Likert statements. Students can select their opinion that goes along with each statement. Make sure each statement has every possible answer response added correctly. When you view the quiz results, Canvas will show you the answers each student selected. Students will also be able to see their answer choices if you allow them to see their responses. Previous Topic:How do I create a Multiple Dropdown quiz question? Next Topic:How do I create a Matching quiz question? Table of Contents > Quizzes > How do I create Likert scale quiz questions? Hello. Just been looking at this myself, and can't work out why the 'quiz' is behaving as if I have selected correct answers for each possible set of answers, whereas actually I want this to work as a survey. I just tested this using an ungraded survey and it did not show an option to select a correct answer. I recommend contacting our Canvas Support team (How do I get help with Canvas as an instructor? ) to troubleshoot why you might be seeing this issue. If you use anything besides an ungraded survey, you will still see the option to select a correct answer. Let us know if you have any other questions. I wanted to follow up with you and make sure you were able to report this to our Canvas Support team. Let us know if you have any other questions or if there's anything else we can help with. If we don't hear back from you on this thread, we'll be archiving these comments in a few weeks.